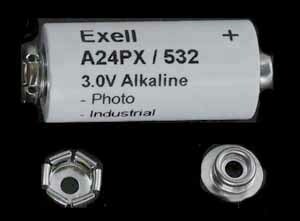 PX24 Alkaline 3V battery used in Polaroid cameras. Known as V24PX / RPX24 / A24PX / EPX24 / 2LR50 / 1308AP. Diameter: 16.8 mm. Height: 42.4 mm. Price: £11.49 each. £10.99 each if you buy two or more. Postage and packing included. Also known as: V24PX / RPX24 / A24PX / EPX24 / 2LR50 / 1308AP. The PX24 or 532 is an unusual cell often used in older Polaroid cameras. It is a cylindrical battery with one large snap connector at each end. The older Polaroid cameras models: 103, 104, 125, 135, 210, 215, 315, 320, 330, 420, 430, 440, M60, and Countdown 70 all use one PX24 or No. 532 (3 volt) alkaline battery. The 335, 350, 360, 450, M80, and Countdown 90 Polaroid cameras use two PX24 or No. 532 batteries, one of which is used for the built-in electronic development timer. The PX24 battery for the development timer can be omitted if this feature isn't needed (for example if you use a stopwatch). The APX24 or 532 is a very hard to find battery. Consider buying more than one. These Alkaline cells have a shelf life of several years, so buy two and make sure you always have a ready supply of power for your camera whilst taking advantage of our reduced price multi-buy offer.